At last month’s blogger party, we received a request for a list of half-price wine nights, so here they are! All of the following venues offer any bottle on their wine list at 50 percent off on these days. You may notice some of your favorite wine spots missing from this list. While they don’t necessarily have half-price wine nights, the wine bars such as Pure Wine and AIDA offer great specials by the glass and discount wine lists. We’ll get into these another day, but this list should give you plenty of options for enjoying a bottle (or two) on your night of choice. 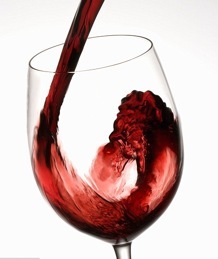 If you know of any other half-price wine nights, leave a comment! Linda has an abnormal fascination with Green Bay quarterback Aaron Rodgers, so we went out yesterday looking for a place near home to catch the Packers v. Bears game. Curious, we strolled into Ranazul, a tapas bar in Maple Lawn, and to our pleasant surprise, we found a big screen projector playing the game behind the bar. Our bartender, Zach, introduced himself and shook each of our hands, as did the manager Michael, who was wearing an exquisite pair of sneakers with his snazzy suit. We felt immediately welcome and taken care of. Michael later told us that he aims to be known as “that manger who wears Chuck Taylors all the time,” and that he had just bought a nice blue pair that day. Aside from watching the game, we were also out to grab a casual drink to celebrate a good friend’s recent birthday. We were pumped to see that Ranazul has happy hour from 3PM – 7PM everyday (even on Sundays! ), which includes $2 off beer, glasses of sangria, full glasses of wine and rail cocktails. They also offer a select menu of tapas for $7 and under. Our orders were modest, and we took our sweet time with our drinks. This did not bother our bartender one bit, and we actually had some great conversation with him. He even gave us a round of his specialty, Chocolate Cupcake shots. Zach informed us that the secret ingredients were Van Gogh Dutch Chocolate vodka, Pinnacle whipped cream vodka and delicious chocolate syrup at the bottom. It was so scrumptious that we shamelessly licked the bottoms of our glasses… Don’t judge. Ranazul’s atmosphere was classy, with mood lighting and snazzily dressed staff, without being uptight. We’d highly recommend Ranazul for a casual after-work drink, a romantic date night, or any kind of intimate get-together. Ask for Zach’s Chocolate Cupcake shot! Since my lovely colleague has decided to skip out on Maryland’s wintry weather to sip on mojitos and cervezas in Costa Rica, it’s just going to be me and my hangovers until next week. But don’t worry – you’re in good hands. However, I have to give a little disclaimer before I begin. I’ve been told explicitly by my co-blogger, Missy, to make it clear that this entry comes from me and only me. Anything that I say in the next few paragraphs does not reflect the views, opinions or football team affiliations of HoCo Hangover as a blog. With that out of the way, I give you the good stuff. As you all know, this weekend marks the beginning of the Divisional Round playoffs and, most importantly, the greatly anticipated game between the Baltimore Ravens and the Pittsburgh Steelers on Saturday at 4:30PM. That means that bars throughout Howard County are guaranteed to be packed with rabid football fans who are ready to gulp down cold beers, tear into some crab cake sandwiches, and cheer at the top of their lungs until their throats are sore. And yes, that includes me. Before I go any further, now would be a good time to make a little warning. If you just so happen to be a Steelers fan with a “terrible towel” in tow, you should probably stop reading. Steelers fans aren’t welcome here. …Okay, I’m just kidding! In all seriousness, awesome drink specials during playoff week is a right that should be guaranteed to all, no matter which football team you root for. As Howard County is the home to a few Ravens players (including running back Willis McGahee who even has his own official HoCo Holiday), it should be no surprise that many bars in the area are going all out for tomorrow’s game. Expect purple beer, purple jerseys, and rounds of shots for every Ravens touchdown. Second Chance Saloon, located in the Oakland Mills Village Center, is one location that is taking Ravens spirit to another level. Their game day specials include $2 purple drafts (Bud Light, Miller Light, and Yuengling), 50 cent wings, and free shots for every time the Ravens score a touchdown. Not only do they have a load of contests for prizes, but you can pin the tail on Polamalu for 2nd Chance Dollas. The recently reviewed Maple Lawn bar, Looney’s Pub South, is guaranteed to be a popular game day spot with its swarms of HD televisions, $2.50 domestic bottles, and $3 Blue Moon/Guinness/Red Stripe Lite specials. If you stick around after the game to celebrate or mourn, you can enjoy their Saturday night live music. Another one of our recommended bars, Union Jack’s of Columbia﻿, offers large screen projectors and full surround sound to maximize your game day experience. Head over for $2.50 domestics, $6 Raven Crushes, $5 Crushes, and $5 appetizer specials. Stick around after the game for live music and their pretty impressive Saturday night “Beat the Clock” special – $1 house drinks at 9pm that go up to $2 at 10pm, and then to $3 at 11pm. My last shout out will go to the River Hill Sports Grille, where you can get your first Miller Light or Coors Light on the house for wearing Ravens gear. All game, they offer $3 Miller Light/Coors Light and $4 Blue Moon 20 ounce drafts. 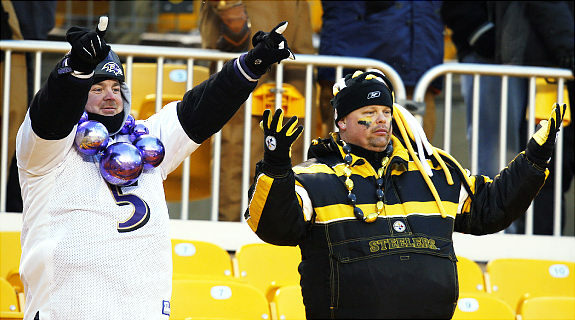 Each time the Ravens score, head to the bar for $2.50 bombs and $1 Bud Light/Miller Light drafts. Have fun, be safe, and cheer hard! Stay tuned for news on Superbowl game day specials.